Video calls included on list of features for the next iPhone? A leaked image of a document called "Key Features" would seem to indicate that video calls will be an upcoming function of the next interation of the almighty iPhone. The document, which was posted on the iPhone/iPad gaming blog No Dpad, has since been removed but not before a picture was taken of it. 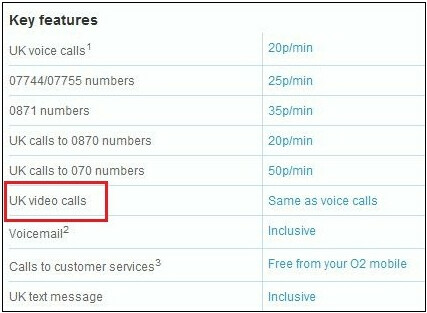 Originally seen on the web site belonging to the U.K. subsidiary of carrier O2, the document shows a pricing schedule for calls in the U.K. to certain numbers. It also shows pricing for U.K. video calls which is revealed to be the same as voice calls. Of course, this could mean that the feature will be available in some European locations, many of which are already used to front facing cameras and video calls. Or, perhaps the next version of the iPhone will allow for Jetsons style video communications in the States as well. Seems to me video calls would need a front facing camera, which would be a hardware issue. Am I wrong? I guess they could sell a detatchable camera or something? It says UK, so maybe AT&T has blocked this too like they have tethering? We are talking about it coming out of the box and working. Most people do not know how to jailbreak a phone and most do not want to go through the hassle of having to do it when most other phones out now already come with what the iPhone can do jailbroken. testman22: Multitasking will be available during summer 2010 for iphones OS 4.0 release...I wouldn't mind doing skype video calls outside the USA as I currently do on my desktop now...no ONLY YOU will think its a new technology kid!